What on earth is in the photo attached to this post, you reasonably ask? Well, dear reader, that would be a patented Tiffany To-Do List, complete with indecipherable chicken scratch, question marks, and random notes. 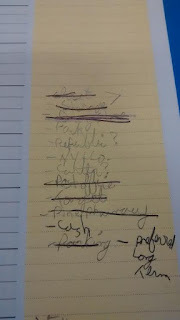 I've actually expanded the list to now include things that I need to pack, with emphasis given to my Kindle, hair straightener, and knitting paraphernalia. I've had little butterflies in the pit of my stomach since last weekend, which is both good and bad. It's good in that it indicates that I'm very excited about my trip this weekend to Atlanta for the Catholic New Media Conference. I don't go on trips very often, and trips by myself are practically unheard of, so this is a wonderful opportunity for spiritual refreshment and fellowship. So what's the bad? Well. :) I'm not sleeping very well because I'm all anxious about the things that I want to complete before I leave (hence the list), and I'm slowly turning into The Funnel Cloud of Tornadoing Tiffany Energy in my efforts to make mincement of the things I want to get done. "I need to mail Irena's birthday gift. Oh. And I have that voucher for NY & Co. that is good only this week and I can use to get a cute new outfit for my trip. And I need to go to Target to get a new suitcase, since our current ones are crap. And I need to look into the parking situation at the airport. And..."
So I made a list. Because lists always make me feel better and more in control. And it's going well. I've been crossing things off like a very eager little bunny, and Mike (who is home with Anne during the day for this short intercession between spring and summer semesters) has been aiding me as well. Yesterday, I excitedly ordered a new bag, because we desperately needed one. I wanted a rolling bag that any of us could use for a trip (translation: not fuchsia or bright purple, which is what I would pick for myself ;-)) that would meet all of the carry-on specifications for any airline. Yes, I am one of *those* people. :0 I would much rather have my little collection of stuff right with me, where it can't get lost on a short trip. For a longer trip, obviously it's different, but for a weekend, I'd rather be sure that my motley assortment of prized yarn and cheap drug store makeup won't go missing when I need it. So I did a little research, and as ever, Amazon to the rescue! Cute orange rolling carry-on bag on it's way to me, due at our house on Wednesday evening. Perfect. I've been assembling things next to the radiator in our bedroom as I think of them that I want to pack. 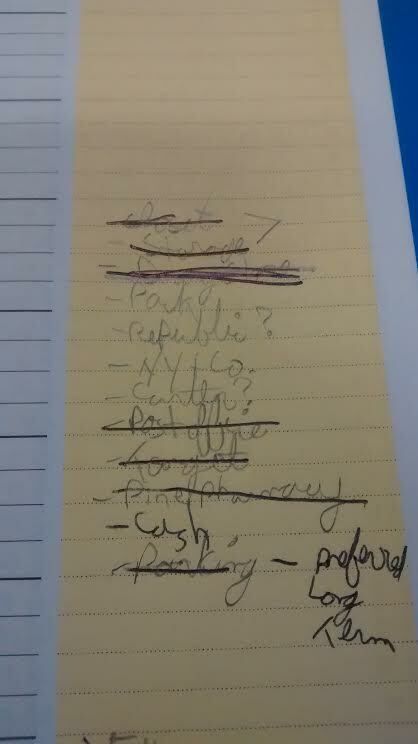 And then each day tackling other things on my list that need to get done. We're getting there! Getting back to the butterflies, the other thing that they indicate is that I am so *nervous*. :) I'll talk about this a bit more in the video post coming this week, but when I meet people in real life that I previously only knew online/via a podcast, it stresses me out a little bit. ;-) I can't help it, I'm a Nervous Nelly; I want people to like me! And I feel like I can really put my best foot forward in an online environment. In real life? All kinds of crazy stuff could happen. I could trip and fall and make a spectacle of myself. I could get something stuck in my teeth. I could develop a fever rash at a very inopportune time. :0 And thus, perhaps the worst case scenario could happen: PEOPLE MAY THINK THAT I AM WEIRD. It's the fear of every introvert, right there. But yes, all that aside, I am SO excited. I leave Saturday morning, and get back next Monday afternoon. I plan tons of fun socializing and learning of new things that will translate into exciting projects right here on this blog. I'll definitely post a full recap next week, and this Thursday I'm planning a video post talking about my previous experience with the CNMC, SQPN and generally feeling a part of an online Catholic community. How are you doing this week, dear reader? Have a safe trip! I'm sure you'll have a wonderful time. Laura, I think we would get along famously. :) I hope that this comes to fruition someday!